The purpose of this page is to go into a bit more depth on commonly-used batteries -- hopefully, as a helpful guide in your decisions about what to use in your 'bots. Here, I'll concern myself with the 3 most-common small battery packages -- AAA, AA, and "9V." Note that other package types are too numerous, and too ill-documented for me to do much with in any global sense. At the very least, when you find a pager or cordless phone battery that you're considering for use in a BEAMbot, you can use the data on this page to "rank" it, and see if it's worth the bother and cost (vs. some standard battery package). While you'll be interested in the different packaging from the standpoint of deciding what will fit on your 'bot, it's not the end of this battery selection story. 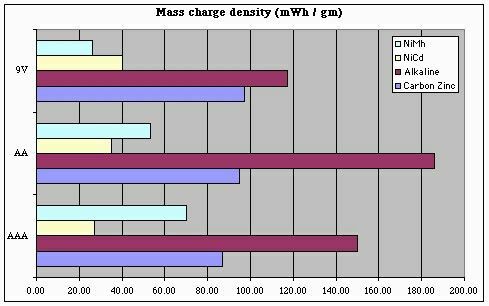 There are a number of different battery chemistries available for our use; while most likely, we'll be interested in rechargeable batteries (NiCd or NiMh), I'm also including Carbon Zinc and Alkaline data for comparison purposes. Note that this is presented as "representative" data, most derived from the Eveready web site, and so may not (most likely will not) be precisely what other vendor's batteries will live up to. You'll note a couple of things in this table. First, "9V" batteries don't always output 9 volts -- rechargeable batteries run at voltages 20% lower than do their non-rechargeable cousins. 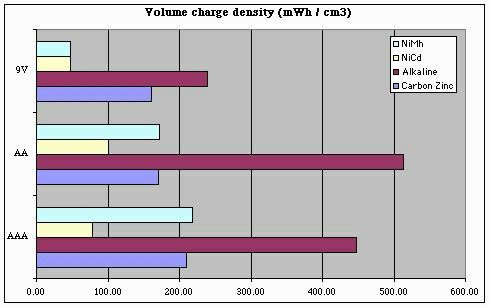 Second, while battery capacity (on the "nameplate") is specified in mAh (milli-Amp hours), I think we need to look at power (vs. current) storage in order to get a valid battery comparison -- so my charge density measures are in terms of mWh (milli-Watt hours, just mAh * nominal battery voltage). Third, you'll want to be concerned about both battery size and weight -- both will determine just how small your 'bot can get. Here you can see why rechargeable batteries are not more widely-used -- they still can't store the amount of power that an alkaline battery can. But looking just at the rechargeables, we can see that "9V" batteries aren't a universally good thing -- they can store just a bit more power (and in the case of NiMh, less power) than AA or AAA batteries. This result really came as a surprise to me. But this chart only tells us part of the story. To get a good handle on 'bot design, we also need to know how our battery capacity will be impacted by size and / or weight limits. 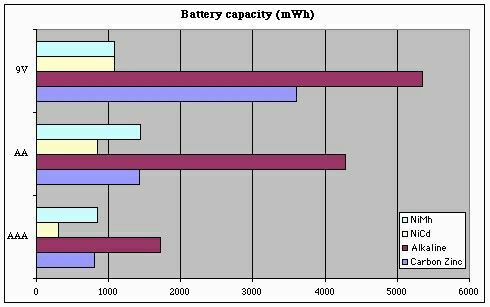 Note that the following charts over-state the storage "efficiency" of 9V batteries, since we can't run our 'bots at 9V (and so, these charts should ideally take into account losses involved in regulating a 9V battery's output down to 5V). For any battery chemistry, "9V" batteries are only a good choice when battery (physical) size is a more important consideration than storage density or battery capacity (i.e., battery life). For copious details on commercially-available batteries, you might want to consult Eveready's "Index of Active Battery Types." Note that this includes few NiCd batteries; these seem to be in the process of being phased out (in favor of NiMh batteries, which have higher storage capacities and fewer disposal issues). All good things come to an end. When your rechargeable batteries no longer take a charge, don't throw them away, dispose of them responsibly -- see here for recycling locations in the U.S. and Canada.